The oil alliance of Opec and Russia has abandoned efforts to drive US shale out of the global energy market, accepting the hard reality of America’s irrepressible frackers for years to come. “To really fight shale we’d need oil below $40 a barrel,” said Kirill Dmitriev, head of Russia’s wealth fund. “That is not good for the Russian economy and it is not good for the Saudi economy. It is not practical, and we are not going to try to fight it,” he told the World Economic Forum in Davos. A string of Opec members would risk incipient insolvency if there were another oil price war along the lines of 2014-2016. Saudi Arabia’s ruling dynasty would struggle to maintain its cradle-to-grave welfare model needed to head off political dissent. Mr Dmitriev, a key architect of Russia’s oil strategy, said his country was working tightly with the Opec cartel and was now pursuing prices of $60 to $70, deemed the optimal range needed to ensure long-term stability. Brent crude has crept up into the bottom of this range after a dramatic sell-off in October and November on global recession fears and a soft US line on Iranian sanctions. The Opec-Russia deal last month to trim output by 800,000 barrels a day (b/d) has restored balance to the market. Surging shale output in the Permian Basin lifted US output by 2m b/d last year, an increase alone equal to the entire production of Mexico. The US has pulled ahead of Russia and Saudi Arabia to become the world’s biggest producer of crude at 11.7m b/d, a feat made possible by America’s deep capital markets and $50bn of equity financing for wildcat projects. Vicki Hollub, chief executive of Occidental, said the Permian was an astonishingly prolific basin with multiple layers of rich resources. Seismic imaging, multi-pad drills, and longer lateral bores have radically changed the economics of the industry. “We’ve driven down the breakeven price of much of the Permian to less than $40, and in some cases even to $30, so there is still going to be a lot of opportunity to grow,” she said. This time investors will be more disciplined. “They have been burned and are much more cautious now. Investors are going to hold companies to account,” she said. Fatih Birol, head of the International Energy Agency, said new pipelines in Texas would unblock a major bottleneck by the end of this year, opening the way for a fresh flood of US shale into world markets. “We’ve not seen the full impact of shale yet. The second wave is on its way,” he said. Dr Birol said it was perfectly plausible that the US would raise output by a further 10m b/d over the next decade. This would entirely change the geopolitical prospects of Russia and the Middle East. John Hess, founder of Hess Petroleum, said the US would keep growing to 15m b/d but then start to hit all kinds of constraints. “Shale is about 6pc of world oil supply now, and it probably will go up to 10pc by mid-decade. Then it flattens out,” he said. We have not seen the full impact of the shale revolution yet, according to the IEA's executive director. We have not seen the full impact of the shale revolution yet. That’s according to Fatih Birol, executive director at the International Energy Agency (IEA), who made the statement in a television interview with Bloomberg on Wednesday. “We have not seen the full impact of [the] shale revolution yet. [There is] more to come both for oil and gas and it will have huge implications for the oil industry, gas industry and the markets,” Birol told Bloomberg in the interview. “There was a major problem in [the] United States in the Permian basin. It is a logistical problem, the pipe capacity was not enough to bring the oil to the markets. And now, as of end of 2019 this problem will be solved with the new construction of the pipelines,” he added. “[An] increase of two thirds of the existing capacity will come there and [the] U.S. oil industry will be able to react much faster and bolder to the international market developments,” Birol continued. 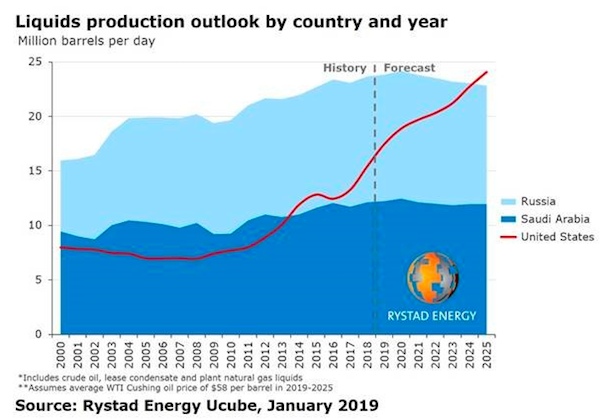 In the Bloomberg interview, the IEA representative also highlighted that, as a result of recent discoveries, U.S. shale reserves are seven times higher than they were in 2010. 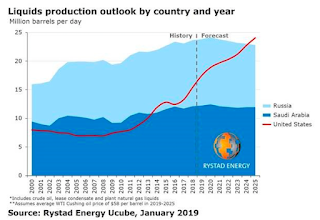 U.S. crude oil production will average 12.1 million barrels per day (MMbpd) in 2019 and 12.9 MMbpd in 2020, with most of the growth coming from the Permian region of Texas and New Mexico, according to the EIA’s latest short-term energy outlook. The White House is weighing a new round of executive actions to boost the U.S. energy industry in an attempt to portray strength against Russia. The moves the White House is considering — President Donald Trump’s third effort to help pipeline companies — include possible executive orders that would weaken states’ power to block energy projects and ease the construction of new pipelines to facilitate the movement of a glut of domestic oil and gas, according to a senior administration official and others familiar with the effort. Trump has promoted energy as an economic and national security boon throughout his presidency. In recent weeks, he has amped up the energy-focused rhetoric, making the case in public and private that low oil and gasoline prices are a sign of the success of his policy agenda — and an indication that he isn’t a pawn of Russian President Vladimir Putin. “This is not only about economic growth and power. A lot of this is about international security policy. We’re aiming at the Russians. We can beat them,” the senior administration official told POLITICO. But a series of executive orders is unlikely to muffle allegations that the president and his allies have kowtowed to Russia, especially with the prospect of special counsel Robert Mueller’s investigation hanging over the White House. Any new executive orders, which could be part of a broader, long-delayed infrastructure plan, would likely draw pushback from Democrats like New York Gov. Andrew Cuomo as well as Republican state leaders who are wary of ceding power to protect their rivers and streams to the federal government. And experts say U.S. exports stand little chance of dislodging Moscow’s hold on key global markets. Trump has pledged to drive “U.S. energy dominance” abroad, capitalizing on the decade-long surge in U.S. oil and gas production that has lifted output to record levels. The sector has remained a bright spot in an economy that experts say may be in danger of dipping into recession. U.S. companies have opened the spigots on oil shipments since the ban on exports was lifted in 2015, and the U.S. has become one of the leading global shippers. But Russia’s oil output has also reached record levels, and its crude exports are second only to Saudi Arabia. Russia is also the world’s leading gas exporter, with a particularly strong position in Europe, which gets more than a third of its supplies from state-run Gazprom. The company notched record shipments to Europe last year and is banking on growing those volumes by 50 percent over the next decade, leveraging its position as the region’s low-cost producer. “We are very interested in undermining Russia’s position with respect to energy in Europe,” the official said. But despite heavy pressure from the Trump administration to block the planned Nord Stream 2 gas pipeline from Russia to Germany and diplomatic trips by Energy Secretary Rick Perry to Eastern Europe to push U.S. liquefied natural gas shipments, experts say the U.S. industry is likely to get only a modest share of the European market — and most U.S. companies are focused on higher-margin markets in Asia. TOKYO -- Chemical products made from U.S. shale gas are flooding Southeast Asia as Chinese tariffs keep them out of what was supposed to be their largest market, with the resulting supply glut dimming earnings prospects at petrochemical companies. "Additional tariffs imposed in the trade war have made it difficult for U.S. companies to export large quantities of shale gas products to China," Japan Petrochemical Industry Association Chairman Kohei Morikawa told reporters Thursday, referring to the 25% surcharge slapped on American goods. "The products have been shipped instead to Europe and Central and South Americas, and are coming to Asia as well," said Morikawa, president of Showa Denko. Ethylene prices plunged to over $900 a ton in December from $1,400 in September in Asian markets. With products diverted from China pushing down prices, high-flying petrochemical companies could now join the list of industries brought down by a drawn-out trade war between the world's two largest economies. The trend is particularly worrisome for Japanese producers, which have managed to improve plant operating rates through painstaking streamlining in light of the U.S. shale boom. For now, Morikawa remains upbeat. "The impact on the Japanese market will not be significant," he said. Products not shipped directly to China will eventually be absorbed by the Chinese market anyway by way of Europe, Central and South America, and Asia, he explained. But Yoshiyuki Fukuda, senior economist at Toray Corporate Business Research, sounds a more cautious note. "Japan will not be immune" to the fallout, he said. "As in the domino effect, when transportation and other costs are added onto prices of shale-gas-derived products, they lose competitiveness," Fukuda explained. "The glut could lead to a crash in prices." In 2017 and 2018, big petrochemical companies like DowDuPont and Exxon Mobil opened multiple production facilities to make ethylene from shale gas. Output from these new facilities exceeds 4.5 million tons -- nearly 70% of annual production volume in Japan. Ahead of this, Japanese companies had streamlined ethylene production facilities as they braced for competition from shale-derived products. Mitsubishi Chemical, Sumitomo Chemical and Asahi Kasei halted domestic facilities between 2014 and 2016, slashing annual capacity by a combined 1.1 million tons. Ethylene plant utilization rates in Japan remained above 95% from November 2015 through June 2018 as a result. With crude prices stabilizing, Japanese companies have managed to revive earnings. Mitsubishi Chemical Holdings is on track to a second straight record full-year profit as the current term winds down in March. Germany’s once-in-a-century experiment, the Energiewende, will enter its hot and decisive phase next weekend. Germany is serious about being the only industrial country in the world to simultaneously abandon nuclear energy and coal-fired power generation. The 31 members of the government commission “Growth, Structural Change, Employment” will decide on the final plan on Friday evening. It will not be a good plan. It is expensive, risky and will hardly benefit climate protection. There are plans for a new political intervention in the energy market that is more serious and riskier than the decision to phase out nuclear power. According to the plan, five to ten large power stations are to be shut down by 2022. According to the plan, by 2030 half of the coal-fired power plants which currently provide around 50 percent of Germany’s electricity requirements, will have been shut down. Power plant operators will receive billions of euros in compensation, the affected federal states and districts more billions as adjustment aid, the coal miners billions as transitional money. And because this massive state intervention in the market increases the price of electricity for everyone, Germany’s energy-intensive industry is also demanding subsidies of between 14 and 54 billion euros by 2030 so that it can survive international competition. All in all, it will cost many billions of euros. However, is all of that tax money well spent? So far, there has been no cost-benefit analysis. Essentially, the taxpayer pays enormous sums for the marginal acceleration of a coal phase-out that had already begun long ago and was already within sight. A large part of the German lignite opencast mines would have been depleted by 2030, and the remaining lignite reserves would have been exhausted by 2050 at the latest. But the well-functioning European emissions trading system is pushing coal-fired power plants out of the market without the need for additional national measures. Germany’s share of global CO2 emissions is just two percent. If the German government forces the phase-out of coal a little earlier by using multi-digit billion euro sums at the taxpayer’s expense, the climate protection effect against the simultaneous massive expansion of coal-fired power plants in China and India can hardly be measured. Without any appreciable influence on the average global temperature, Germany’s withdrawal from coal can only be justified by its exemplary function. Other countries would be encouraged to follow suit if such a large industrial nation as Germany can prove that deep decarbonisation is possible. Unfortunately, the German coal phase-out does not provide such a proof. Buying up and shutting down an entire industry practically with astronomical amounts of tax money is not a blueprint that coal countries like Poland, the Czech Republic, India or South Africa could follow, even if they wanted to. In its search for role models, international climate policy is therefore no longer looking to Germany, but to Great Britain (sic), which has successfully reduced the share of coal to a pre-industrial level within just a few years by means of lean CO2 pricing. Such reservations about abandoning coal are not automatically reservations about the energy system transformation: If renewable energies can be upgraded to reliable electricity suppliers with the help of storage facilities and grids, they will automatically displace fossil power plants with their higher production costs. But taking coal-fired power plants out of the system by government intervention before sufficient grids, storage facilities and green electricity suppliers are in place only tears up a dangerous energy gap, of which it is not clear whether and how it can be closed. To rely on electricity imports from abroad in an emergency, as the Federal Government explicitly does, is a risky bet. After all, more and more conventional power plants are being taken off the grid in all neighbouring countries. Climate activists and green politicians, who deduce the existence of over-capacities from the annual average values of German electricity exports, have either failed to understand the energy market or are deliberately misleading the pubic. Angela Merkel has made a shrewd move with the appointment of commissions: Already during the nuclear phase-out a committee composed of representatives of “civil society”, scientists and and church people legitimized later on the rather lonely decision of the Federal Chancellor. In answering the question as to whether an exit from coal is necessary, appropriate and feasible, the head of government once again has simply shifted the responsibility onto a commission. But it is by no means certain whether the calculation will work out this time. That is because if the coal commission agrees on an exit plan, the recommendations should lead to a German climate protection law. But a federal law on climate protection would be new legal territory. Ideally, such a law would give both industry and energy producers long-term planning security. Depending on its form, the planned law could also become a weapon in the hands of non-governmental organisations (NGOs) which would sue the government for political climate protection measures in court. As is already the case today with diesel driving bans, German climate policy could end up in the hands of judges who are challenged by technical issues. Despite the high technical level of the Commission’s work, the final paper is still being haggled over like traders at the bazaar. Industry is already threatening to veto the plan if billions in electricity price compensation are not forthcoming. Representatives of environmental groups insist on the immediate shutdown of power plants to an extent that other members of the commission consider irresponsible. It remains uncertain whether the Commission can agree on a roadmap that policy makers can also sell as a socially accepted coal compromise. If the coal commission fails, the Chancellor will be faced with the ruins of her climate policy.